Our Soft Yoga Mat is a great alternative to your ordinary Sticky Yoga Mat. They are used in many studios, homes, schools, spas, gyms and health clubs all across The United States and all over the world. Our Soft Yoga Mats are made of high density fabric that allows ventilation for hygiene, but will not let any harmful bacteria go through while protecting against certain allergies. 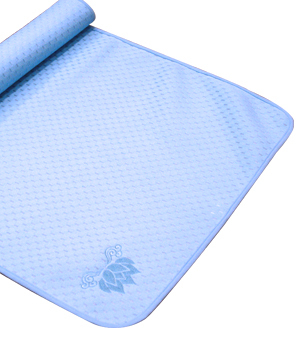 This mat is safe and environmentally friendly by using non-toxic silicon anti-slip materials. The best part about this mat is that it is so lightweight, making it easy to carry to and from class. Also our Soft Yoga Mat is a great mat for travel, or to put over studio mats for extra stick and protection.